Cross wedge rolling machine is widely used in forging connecting rod, crankshaft, camshaft, auto parts, etc., with the advantage of high productivity, efficiency, high rate of finished products. What’s more, the tools can be used three times longer than air hammers. 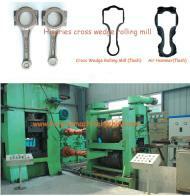 Our company is specialized exporter, manufacturer and supplier of connecting rod forging machine in 中国.